Motorcycling as a hobby or main form of transport has seen a resurgence in popularity over the past seven years or so. As we all know, the impacts of the 2008 financial crash were felt globally and the motorcycle industry was not immune to the recession. New bike sales fell off a cliff with riders opting to downsize their fleet and get back into their cars or just hang on to their older models. Thankfully things began to slowly pick up at the turn of the decade with manufacturers investing ever increasing amounts into R&D in the hope of tempting people back onto two wheels. And it worked. Yamaha took the world by storm in 2013 with their MT/FZ 09, following a year later with the hugely popular MT/FZ 07 both of which were a sales success. The best part was that these bikes were affordable and therefore accessible to the masses. Fast forward to today and manufacturers are still enjoying record sales with BMW having recently completed their best ever year yet. But prices are on the rise. Call it inflation, increased demand or the effects of currency exchange rate fluctuations, bike prices are on the up. Which isn’t in itself a bad thing as there are some great finance deals out there allowing you to step onto a top of the line bike with a low monthly payment, but as with anything, an increase in value has started to attract the wrong sort of attention. Make no mistake, bike theft has always been a problem but we can’t help but think that an increase in values have contributed to the issue. A total of 128,644 bikes were registered in 2016, a staggering 11.7% year on year increase over 2015. Now contrast that with the fact that more motorbikes were stolen in 2016 than were sold new. The problem has become so severe that a report was commissioned by the National Crime Intelligence Service which has now been passed on to Police forces around the country. 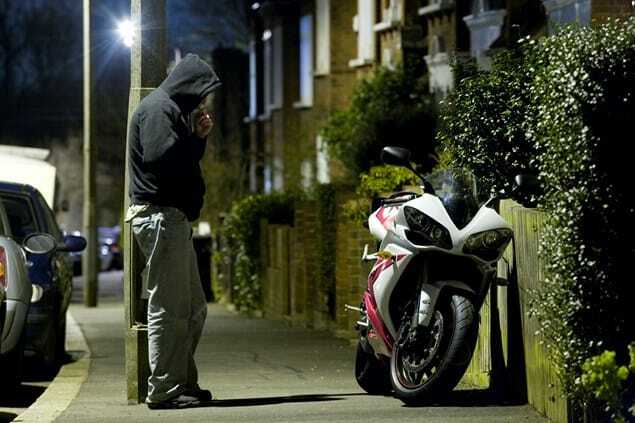 To put the problem into financial terms, £3,000,000 worth of bikes are stolen in the UK every single month. Scooters, mopeds or top of the line sports bikes, it doesn’t really matter. In fact, scooters and mopeds are a popular target in London as they are the vehicle of choice for thieves looking to steal more bikes. If left unsecured, they are taken in seconds and pushed or ridden off, either to be sold whole, for parts, or used in further crime. On a more sinister note, 2017 has also seen the rise of extreme violence being used as an aide in bike jackings or to deter onlookers from intervening when they see a bike being taken. This can range from brandishing screwdrivers, angle grinders or the use of acid to inflict burns on victims. In response, we’ve seen reports that a number of vigilante groups have formed with the aim of tackling these motorcycle theft gangs head on. We do not condone vigilante action and urge all victims to report incidents to the Police. According to the National Insurance Crime Bureau, 46,467 motorcycles were reported stolen in 2016, a 2% increase on the previous year. This accounts for 1 bike being stolen every 11 minutes across the country. 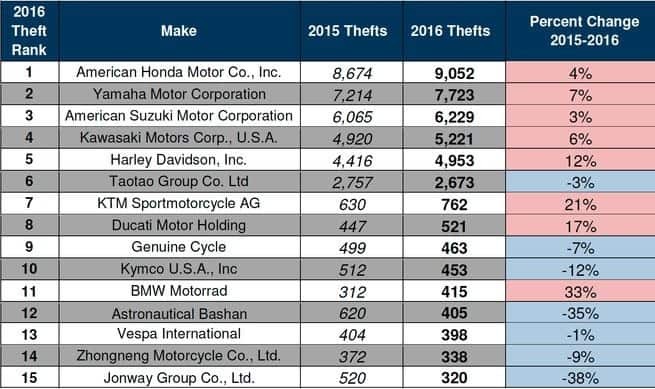 Honda were the bike most stolen with 9052 reported thefts, followed by Yamaha, Suzuki, Kawasaki and Harley Davidson. From this we can conclude that supersport or sport bikes are at the top of the most desirable list with cruisers bringing up the rear. There appears to be a seasonality to the thefts, showing an increase in the Summer months of June, July and August. This is likely due to more bikes being on the road at this time of year and organised crime gangs taking advantage of this. The most prolific State was California with a grand total of 7506 thefts, followed by Florida, Texas and South Carolina. As far as cities go, New York reported 1209 thefts, followed by San Diego, Las Vegas and Los Angeles. The figures are not quite as bad as the UK but there is clearly room for improvement. A ground anchor and security chain are always going to be your best line of home defence with high quality motorocycle disc locks a great option for when you’re out and about. It looks like we’re set for another record year for thefts. 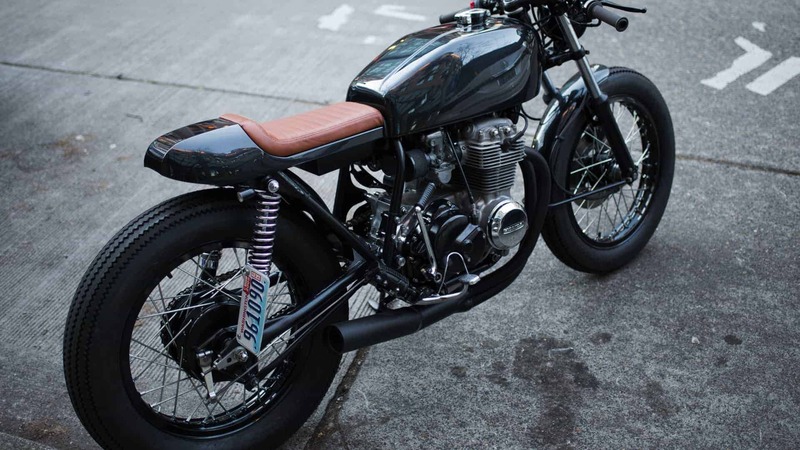 There is no substitute for effective motorcycle theft protection. You can’t always keep your eye on your bike so make sure it is secured properly. Your insurance premiums and your bank balance will thank you for it.